A key to a successful SEMA Show for buyers is discovering new contacts and products. This list of first-time exhibitors includes more than 250 possibilities. Attendees of the 2018 SEMA Show have several opportunities to prepare now for a successful week in Las Vegas. First things first: More than 250 first-time exhibitors are already on the floorplan. Each of those companies represents a potential lead for new products and business opportunities. The following list is organized by Show category to make it easy for buyers to begin their research. Many of these exhibitors will be located in the Show’s expansion areas—the Performance Pavilion, the Racing Annex, Upper South Hall or the Westgate Las Vegas Resort & Casino—so be sure to include those areas in your Show itinerary. As always, the full, up-to-date exhibitor listings are available at www.SEMAShow.com/floorplan. Now is also the time to secure Show credentials and book hotel rooms. 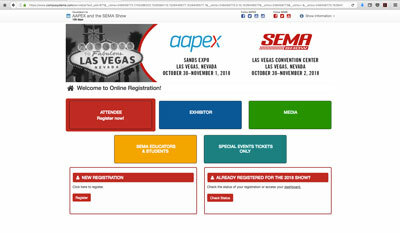 Registration is open at www.SEMAShow.com/register. Approved domestic buyers who register online prior to October 12 will pay the lowest price of $40 and will have their badges mailed to them before the Show, thus avoiding lines on-site. Additionally, the best deals on hotel rooms can be found at www.SEMAShow.com/travel through the official SEMA Show housing partner, OnPeak. If you’re not yet registered for the 2018 SEMA Show, visit www.SEMAShow.com/register prior to October 12 to ensure that you receive the lowest price for badges. Guangzhou Yakoo Chemical Co. Ltd.
Cangzhou Sheen Auto Parts Co. Ltd.
Henan Farride Rubber Technology Co. Ltd.
Lenston Rubber Technology Co. Ltd.
Loudi City Zhuo Rui Chemical Co. Ltd.
Shandong Fuyu Lanshi Co. Ltd.
Shandong Longyue Rubber Co. Ltd.
Shandong Zhentai Group Co. Ltd.
Weihai Joyall Tire Co. Ltd.
Xinjiang Kunlun Tyre Co. Ltd.
Sage Human Electronics International Co. Ltd.
Shenzhen Mingzong Technology Co. Ltd.
Zhongshan Changfan Auto Security Equipment Co. Ltd.
Visit www.SEMAShow.com/floorplan for the most up-to-date exhibitor listings and information. Center of Repair Technologies Ltd.
Federal New Power (Qingdao) Co. Ltd.
Greatwall Automotive Parts Co. Ltd.
Wuxi Booshiwheel Power Technology Co. Ltd.
ADSG Dongsai (China) Car-Styling Co. Ltd.
Guangzhou Guangxiang Auto Accessories Co. Ltd.
Guangzhou Helioson Car Care Co. Ltd.
Guangzhou ZSMELL Auto Accessories Co. Ltd.
Huizhou Inoch Technology Co. Ltd.
Taizhou Yusen Auto Accessories Co. Ltd.
YATU Advanced Materials Co. Ltd.
Zhejiang Tianyuan Fabric Co. Ltd.
Qingdao Passion Machinery Co. Ltd.
Suzhou FengYi Technology Co. Ltd.
Guangzhou Superlight Electronic Technology Co. Ltd.
Lovells Automotive Systems Pty. Ltd.
Ningbo Fentol International Commerce & Trade Co. Ltd.
Ningbo Jii-Power Auto Accessories Co. Ltd.
Cangzhou Shengshiweiye Automobile Accessory Co. Ltd.
Guangzhou Jova Car Accessories Co. Ltd.
Jiaxing Tangdong Auto Parts Co. Ltd.
Kunshan Zhongyite Machinery Industrial Co. Ltd.